Swiss baroque violinist Maya Homburger and British bassist-extraordinaire Barry Guy are partners in life and in music, and they have created a unique approach to Baroque classicism and Jazz-derived modernism which has raised the hackles of some purist authenticists (EMR "I don't know what our readers will make of new takes on Biber and Castello, so far removed from HIP [Historically Informed Performance] policies as to be irrelevant"). But Barry Guy (who has spent many years playing bass in the Academy of Ancient Music, as well as in the Howard Riley and Evan Parker Trios and leading the Jazz Composers Orchestra) explains carefully in his notes for DAKRYON their joint aim of "musical stretching" for "intelligent open minded listening" in the 21st century. The intention is to celebrate the congruence of two traditions which valued improvisation more than three centuries apart, c.p. shallow "spicing up" by one genre to make another more acceptable. Their previous duo CD Ceremony (ECM 1643 453 847-2) likewise featured Biber alongside compositions by Barry Guy and, as Ken Waxman wrote in Jazz Weekly "Nowhere do you get the idea that it's merely the classically trained violinist who is playing the lyric melody, while the jazz bassist slaps out strident rhythmic decorations - - Ceremony features Homburger live in the studio improvising against seven pre-taped tracks of herself playing four other specially-tuned violins. Guy's string treatments seem perfectly aligned with those of Biber, who, after all, was one of the first composers to use scordatura, the unusual tuning of strings". The booklet carries a full and illuminating interview in which both musicians discuss and explain their artistic credo. This new CD Dakryon is another captivating sequence. 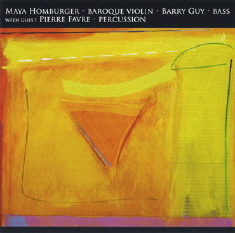 Guy on his own substitutes convincingly for the usual continuo, and allows his imagination to flow freely in his compositions, some of them here with the addition of contributions from percussionist Pierre Favre. Readers of Musical Pointers should enjoy following the diverse but unified programme on its own terms; a special listening experience and a unique CD (as every new release should aim to be with the catalogues so crowded, not to speak of the mountainous graveyard of deleted canonic standards). The juxtapositions illuminate both musics. An earlier self-published CD, Maya MCD0301, has Maya Homburger alone playing her Costa baroque violin. It was the first of a projected three disc set devoted to Bach's solo suites and sonatas, each with an intervening 'sorbet' by Barry Guy to clear the palate. Her performances of the Sonata No 1 and Partita No 1 are engaging and compelling, and all the better for the leaner timbre of the baroque instrument, which takes us (speculatively) closer to JSB's own world than some romanticised performances on modern violin. I do not have the specialist expertise to critically compare these accounts of Bach staples with, say, those of Podger and Huggett, both of which I enjoy. But I do far prefer Bach's solo string music to be programmed alongside other music, here a solo version of Guy's "butterfly" piece Inachis (expanded with electronics in the DAKRYON CD) dedicated to the memory of Maya's photographer mother, who had "captured the fleeting beauty of countless butterflies". Beyond that hint, no explanatory note is supplied. 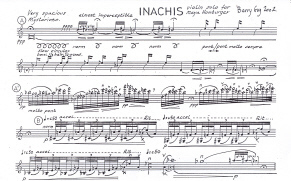 The score of Inachis is beautiful to hold, easy to read as hard to play whilst following either version of the piece, and it reinforces listening pleasure (contrasting with some contemporary music scores which can leave you reeling with bewilderment). For the Bach sonata and suite we are provided with an extensive numerogical essay by Ruth Tatlow on the mathematical proportions that can be discovered in Bach's solo violin music; interesting if recondite, but out of place in a CD note and of no direct help to the listener. Recording and production are exemplary in all these CDs and I look forward to more "musical stretching" of our ears and the completion of the Bach/Guy series*. Visit the Maya website to see Homburger/Guy programmes, and take a virtual tour around the couple's Irish home, Temple of Light, advertised in the Observer as being now on the market. 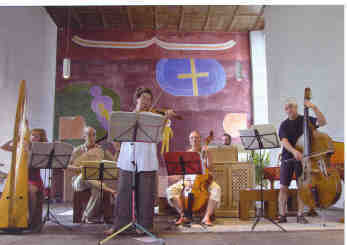 *Maya Homburger's next solo CD, with Bach in a-minor & d-minor and Barry Guy's AGLAIS, is planned for recording in 2006. Maya Homburger's latest CD, received at Easter 2007, is of the Biber Mystery Sonatas, recorded with Camerata Kilkenny at St Gerold in Austria (illustrated) and most welcome it is. Maya Homburger uses half a dozen different violins (couldn't we be told more about them, and why? - perhaps so that precious instruments be undisturbed by Biber's ground-breaking scordaturae, which "transport the performer into another world", a "trance-like state and detachment from - - virtusosic violin-playing".) Indeed, I find Maya's performance more mystical and less overtly virtuosic than some others; they are calming, and best heard a few at a time. This version has a substantial accompanying ensemble stemming from the couple's years in Ireland, including Maya's long time partner Barry Guy (who I first heard in jazz with Howard Riley) on double bass. Highly recommendable, as are all the discs on this unique label. Another wonderfully conceived and created CD, which continues Maya's Bach solo violin series on baroque violin and contrasts it with another of her partner Barry Guy's butterfly compositions, this one for Maya alone. The Aglais butterfly is depicted as "light, transparent and ethereal, with discoloured unison pitches and floating harmonics" (Barry Guy).It is a substantial ten minute work and I hope it will find other interpreters and achieve a concert life. Relating to the 'nature' theme, there is also a lengthy essay by Elizabeth Binde about a famous Durer picture Das grosse Rasenstuck". Bach interpretation is a minefield onto which I shall not venture. At the end, preferences are subjective and I love Maya Homburger's way, which eschews showy virtuosity just to impress the listener. Her calm account of the great Ciaccona emphasises structure and the acoustic in the Stadtkirche Boblingen sounds just right. I look forward to the third CD which will complete this fruitful project.